Travelogue of An Armchair Traveller: Ancient Megalith With Laser Cut? Ancient Megalith With Laser Cut? Al Naslaa is an amazing megalith on the outskirt of Tayma oasis in north-western Saudi Arabia. Amazing feature of this megalith is that it has a very precise vertical split in its middle, as if it has been cut with some modern tool like a laser beam. 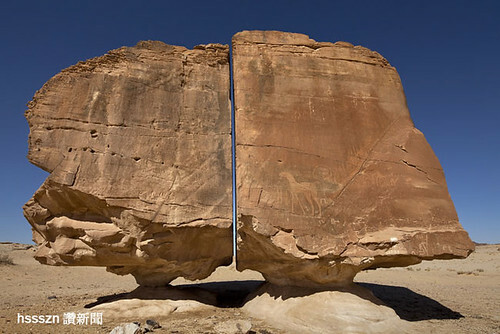 The two pieces of the stone have a gap of only few centimetres and remarkably each of these two massive pieces are precariously balanced on very small base. 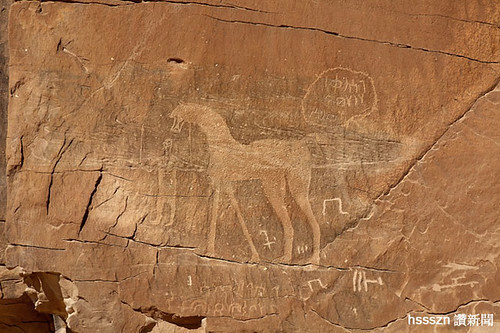 In addition to the vertical split, one side of the stones is very smooth with Petroglyph and Hieroglyphics markings on it. Discovered in 1883, it has remained a mystery stone till date, with theories about its origin ranging from natural phenomenon to extraterrestrials or use of some advanced technology by some lost race. Most of the geologists however are of the opinion that it is a natural phenomenon caused either by slight subsidence of one of the two supports or by erosion of fault at the divide. "Geologists who have examined the fracture say that it was probably formed when the ground beneath it was offset, causing the rock to split apart. It has also been suggested that it could be an old fault line. The rock material near faults tends to become weakened and erodes more easily. 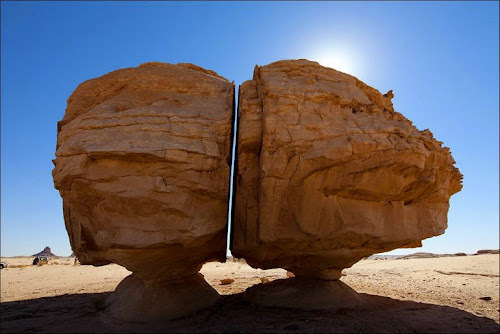 As sand blew into the cracks of the rock over the ages, this material may have been more rapidly eroded than the surrounding sandstone, resulting in the fracture." Tayma has a long history of settlement and the area is archaeologically rich. May be some day some finding can prove beyond doubt about the origin of this amazing megalith. The megalith as seen from other side. Based on image from IndoCropCircles.com (shown below) it's height would be at least 6 metres (20 feet), if not more.